Posted on 12, September 2018 by EuropaWire PR Editors | This entry was posted in Automotive, Education, Energy, Gas & Oil, Germany, Technology and tagged carbon_dioxide, combustion, designer_fuels, diesel, Dominik Pélerin, Dr. Martin Härtl, hydrocarbons, oxymethylene, oxymethylene_ether, synthetic_fuel, XME Diesel project. Bookmark the permalink. MUNICH, 12-Sep-2018 — /EuropaWire/ — Emissions-free combustion engine cars – synthetic fuels like oxymethylene ether are bringing the idea into the realm of the conceivable. 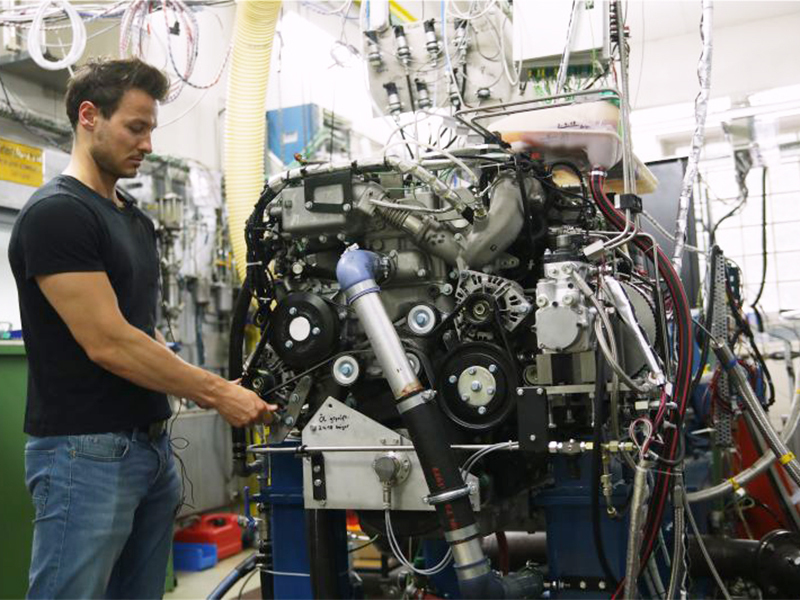 Researchers at the Technical University of Munich (TUM) have tested how this kind of fuel behaves in engines and have developed an optimized combustion process. They generate carbon dioxide, particulate matter and nitrogen oxides: combustion engines are in the cross-hairs of public opinion and many inner cities have already imposed driving bans for certain kinds of diesel-powered vehicles. But synthetic fuels like the group of oxymethylene ethers (OMEs) might hold the answer. They burn virtually free of undesirable by-products such as soot and hydrocarbons, and thus provide an additional air-quality benefit over other long-standing designer fuels. However, they also have disadvantages: production costs are higher than those of fossil fuels and there are no production facilities available yet. The XME Diesel project, funded by the German Federal Ministry of Economics, aims to promote the use of OMEs. Scientists from TUM’s Chair of Internal Combustion Engines are also involved in the project. They investigated the behavior of OMEs in engines, the adjustments required to improve combustion efficiency and the degree to which harmful emissions can be reduced in comparison to fossil fuels. “We determined that using this fuel can significantly reduce pollutant emissions,” explains Dr. Martin Härtl, who coordinates the project. “The Euro 6 level, the currently applicable limit, is easily met when using the synthetic fuel. We are also convinced that high-performance exhaust after-treatment can even reduce emissions to almost zero.” OME made from waste CO2 – carbon dioxide generated in processes in the steel and cement industries, for example, or in coal and gas-fired plants – and electricity from renewable sources, would even be carbon neutral. The tests were carried out as part of the project “XME Diesel – (Bio) Methyl Ethers as Alternative Fuels in Bivalent Diesel Engines,” funded by the German Federal Ministry of Economic Affairs and Energy. Further research in the field of OMEs at the Institute of Internal Combustion Engines is part of the project “OME – Environmentally Friendly Diesel Fuel Additives” (funded by the Agency for Renewable Resources with funds of the German Federal Ministry of Food and Agriculture) and the project “Sub-Zero-Emissions Diesel Engine” (funded by the Bavarian Research Foundation).